Hope you are all enjoying Spring Break!! Here’s an update on our activities! History: We completed our study of China this week by taking a closer look at Taoism and Confucianism, and by trying hands at painting on silk. We also began to explore the origins and practices of Islam as a way to provide context for reading I am Malala by Nobel Peace Prize Winner Malala Yousafzai. English and Writer’s Workshop: Students enjoyed reading and discussing Bridge to Terabithia as well as viewing the film. We have completed our mini-unit on Word Choice, one of the 7 traits that good writers use. Each student outlined and wrote a process essay with a focus on word choice. Math: Fractions have been the topic of conversation in math class. We’ve been working with mixed numbers and learning to regroup in order to subtract. Students will continue to explore operations using fractions in April, as well as begin to play with measurement conversions. We had some fun before vacation using fractions to bake chocolate chip cookies. However, in the consumption of these, I must admit there were no fractions of cookies left uneaten!! Enjoy the slideshow and have a restful break! Fifth Grade students have been studying the rise of civilization in the regions of the Indus and Ganges Rivers. This week, we focused on the beliefs and practices of the world’s oldest religion, Hinduism. We welcomed Preeti Kedia to our classroom to share with us her practices and beliefs, and to answer our questions. While each student prepared at least 2 thoughtful questions, her visit sparked so many questions that we ran out of time to ask them all. 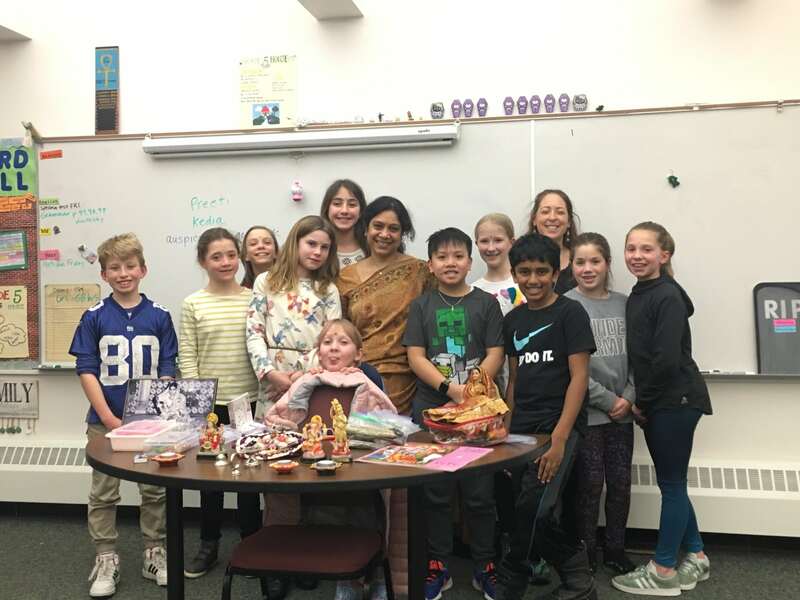 Students were interested in topics ranging from life cycle rituals of birth, marriage and death to what gods are favored in Mrs. Kedia’s family, what a Sanskrit prayer sounds like and where she buys all those spices she brought for us to smell!